← The Jack Webb Blogathon: A List Of Suspects. 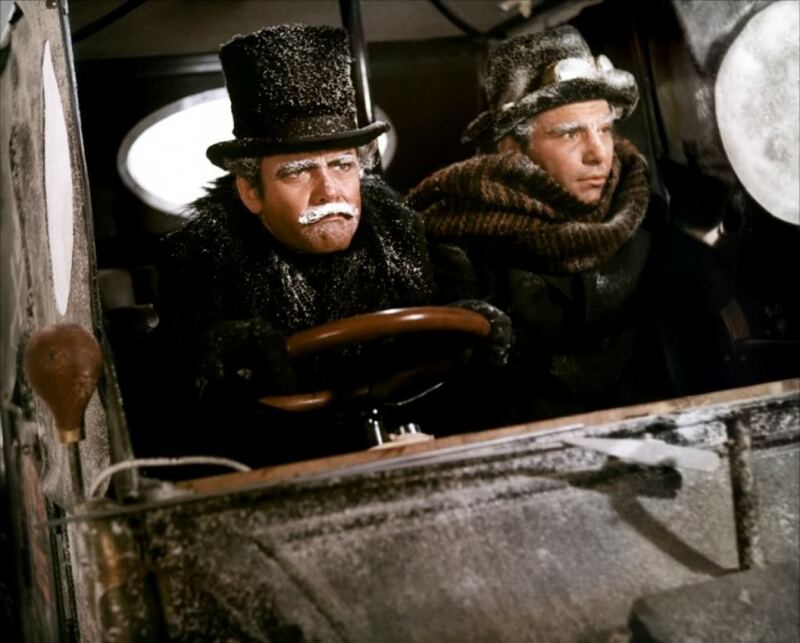 Blu-ray Review: The Great Race (1965). Cast: Jack Lemmon (Prof. Fate), Tony Curtis (The Great Leslie), Natalie Wood (Maggie DuBois), Peter Falk (Max), Keenan Wynn (Hezekiah Sturdy), Arthur O’Connell (Henry Goodbody), Dorothy Provine (Lily Olay), Larry Storch (Texas Jack), Ross Martin (Baron Rolfe von Stuppe), George Macready (General Kuhster), Denver Pyle (Sheriff). Blake Edwards’ The Great Race is the kind of movie Blu-ray seems made for: a great big Panavision roadshow piece of Technicolor eye candy. And from its overture to the final fade, the new disc from Warner Archive is a thing of real beauty. Part homage to silent films (dedicated to “Mr. 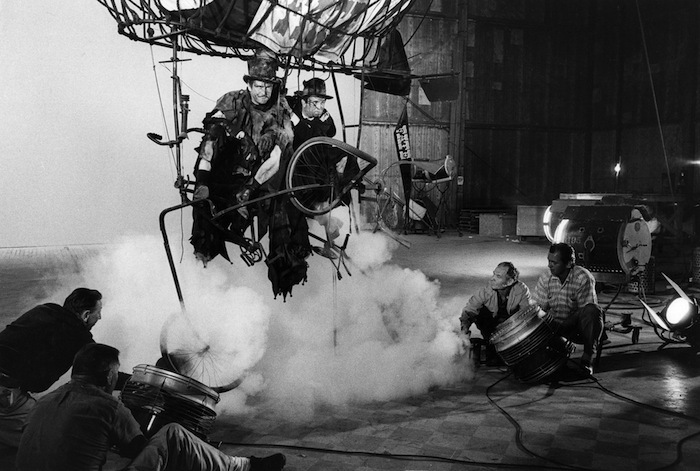 Laurel and Mr. Hardy”), part live-action cartoon, with The Great Race, Blake Edwards tried to pull off the near-impossible task of making an epic comedy. It’s up to the viewer to decide if he succeeded or not. The Great Leslie (Tony Curtis) and Professor Fate (Jack Lemmon)—inspired casting of the male leads of Some Like It Hot (1959)—are daredevils in the early 1900s. Leslie is the dressed-in-white hero who always comes through unscathed; Fate’s a combination of your typical black-clad silent movie villain and Wile E. Coyote, whose plans always blow up in his face, sometimes literally, with a “Ta-Da!” from Henry Mancini. Fate is accompanied by his ever-loyal and equally-inept assistant Max Meen (Peter Falk), while Leslie has Keenan Wynn in his corner. Establishing these characters and their rivalry makes for a hilarious first reel (which the rest of the movie has to work hard to live up to). An around-the-world automobile race is announced (Leslie’s brainchild), setting the “course” for the rest of the film—with Natalie Wood on hand as Maggie DuBois, a reporter covering the race. After a number of setpieces involving everything from a saloon brawl to a stowaway polar bear, it settles down to a Prince And Pauper retread that treats us to two Jack Lemmons and keeps Miss Wood in her underwear for the last 45 minutes or so. And just for good measure, it all climaxes with a truly epic pie fight. Making The Great Race turned out to be a bumpy road. Edwards clashed with Jack Warner, and he was actually removed from the picture. The cast united to have him brought back. Costs piled up. 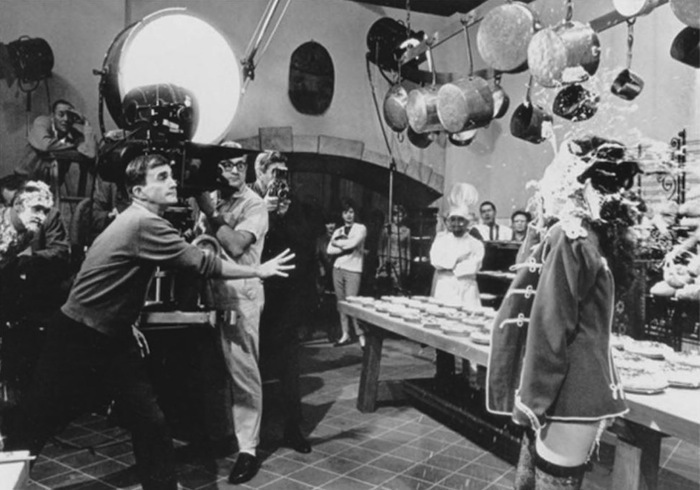 And the pies went rancid from one day’s shooting to the next—the set would have to be hosed down and redressed with fresh pies. The whole thing ended up 24 days over schedule. 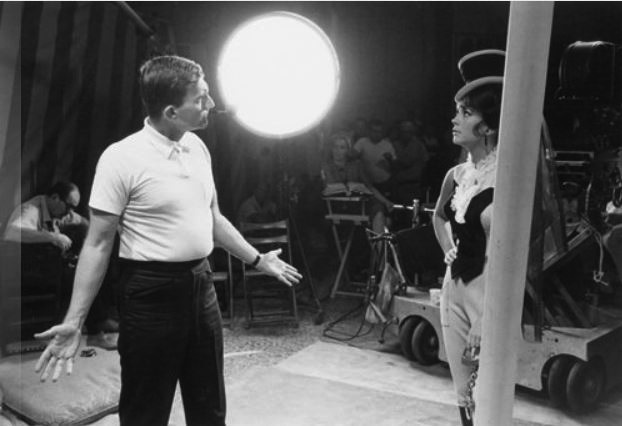 What’s more, Natalie Wood wasn’t too thrilled about the whole thing. She owed Warner Bros. another film, and she went into The Great Race grudgingly to take care of that obligation. The part had already been offered to Jane Fonda, who decided to do Cat Ballou instead, and Lee Remick, who’d done Days Of Wine And Roses (1962) with Edwards and Jack Lemmon. Wood and Edwards didn’t get along. She demanded that Edith Head do her costumes. And while shooting the pie fight, Edwards himself threw the pies meant for Natalie. Turns out comedy is no laughing matter. Critics didn’t find a whole lot of greatness in The Great Race. When you advertise a movie with the tagline “The greatest comedy of all time,” you’re probably asking for it. And in the end, it wasn’t the runaway hit everyone was hoping for—especially since it cost a then-mammoth $12 million. But time has been kind to Edwards’ salute to slapstick, and it has a healthy following. This was certainly aided by the fact that an episodic film like this plays pretty well on television—strategically-placed commercial breaks can’t completely destroy its rhythm. That’s where kids like me found it in the 70s and fell in love with it. 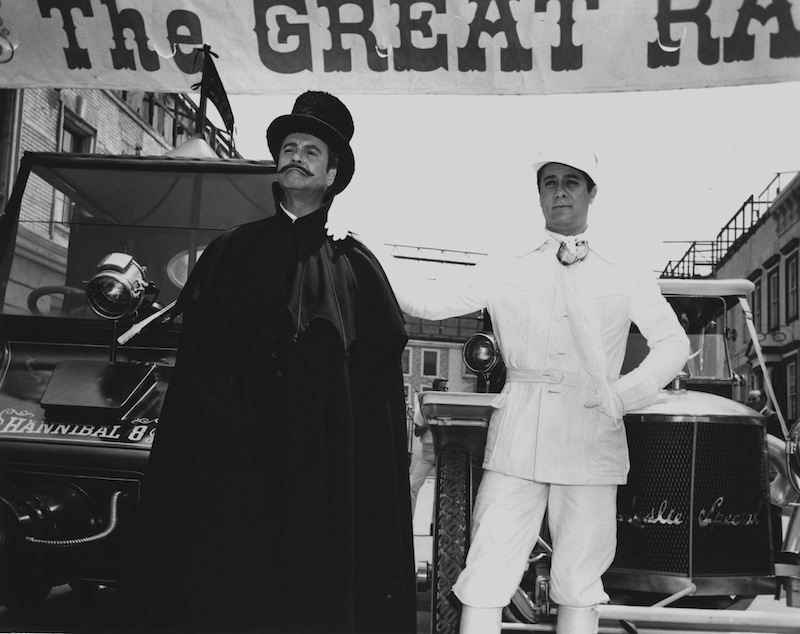 The Great Race presents its great cast and crew at the absolute peak of their powers. Lemmon’s a riot in his dual role (I’d be happy with another two hours of Fate’s disastrous stunts). Curtis is perfect as the perfect hero, bringing just the right amount of life to a character that’s required to be somewhat bland. Natalie Wood’s both funny and beautiful. Peter Falk comes close to stealing the whole thing. Blake Edwards brings all this chaos together and makes it work—though some find it an exhausting experience. And, of course, Henry Mancini knocks off another brilliant score. Take a quick look at that list and realize that everyone associated with The Great Race has passed on: Lemmon, Curtis, Wood, Falk, Edwards and on down the line. But almost 50 years after its release, in The Great Race, they seem vibrantly alive on the new Blu-ray from Warner Archive. Russell Harlan’s Oscar-nominated camerawork is really shown off here. Colors pop and the image is amazingly sharp and detailed. (Wish the same could be said for the Blu-ray of his work on Rio Bravo.) The stereo is clean, giving plenty of punch to Mancini’s music and the cartoonish sound effects (many of which you’ll recognize from your favorite WB cartoons). We’re treated to the roadshow presentation, complete with overture, intermission and exit music. If I didn’t already have a Blu-ray setup, this one would’ve pulled the trigger—it’s an all-time favorite, and a real demonstration of everything the format can do, from astounding clarity to film-like texture to warehousing a sizable stash of extras. Highly, highly recommended. Nice piece, Toby! I love this film, too. Interesting to hear how Edwarda nd Wood didn’t get along. Nonetheless, she’s fine in the film and looks exceedingly beautiful throughout. Have to pick this BD up pronto. This is one of the nicest-looking Blu-rays I’ve seen. In places, it was like seeing it for the first time. 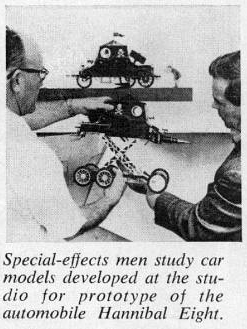 It’s a shame they didn’t make toys from this movie, similar to the Corgi James Bond vehicles and stuff.